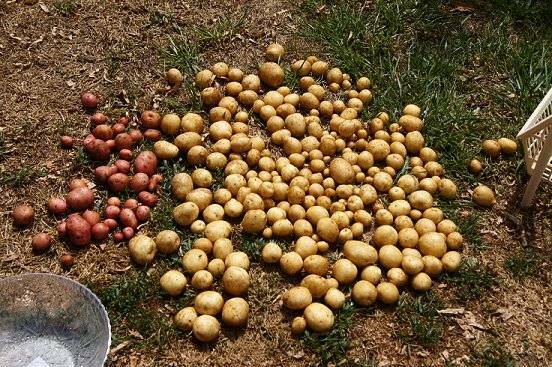 We have a 3 x 6 garden that we plant potatoes in, and last year I tried making layers of different colors of potatoes planted on top of each other, and it worked, so this year I made two layers, white on bottom and red on top. I cut the potatoes in half, and laid them out in the first layer, 4 per square. I pushed them down into first 6 inch layer of soil mix. Then I added the red potatoes on top of that. 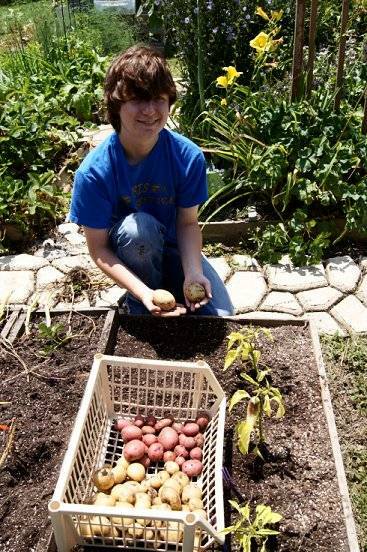 And the layer on top is 4 inches deep, and I covered the red potatoes with more soil mix. All done, and I'll keep you posted how everything turns out. 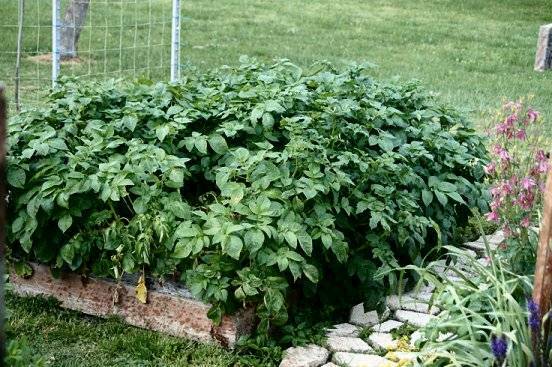 Anyone else growing potatoes this year? How are your going to grow yours? I was seriously thinking about it, as I mentioned in your other post. But, I haven't ordered seed potatoes yet! I'm hoping to order them in the next week. DH left me at home to take care of our new baby chickens instead of us both going out this time, so I'm really hoping that I can get our beds started soon. They are starting to come up! Sometimes we just use the store bought potatoes that have started to sprout, and they do just as good as seed potatoes. Well, I have several different "seed potatos" that the grocery store was selling, but I only got about 6 of them. 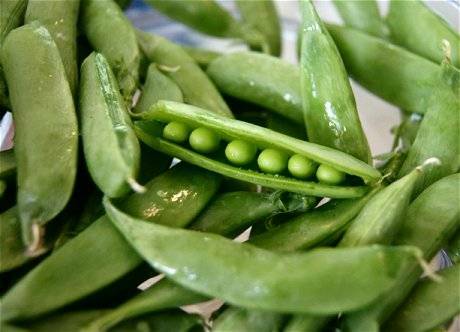 Maybe I'll just plant those 6 (after cutting them up) and see what I get out of it. How many eyes are needed per piece? I've never done potatos before. Do I need to cut them up and let them "dry out" a bit on the cut side before planting them? I usually cut mine into 4 pieces, and each piece needs at least one eye. Some people do lay them out to dry out some before they plant them, I never have, I just plant them right when I cut them. Drying them out is suppose to prevent diseases or something like that. But I've never had any of them get anything wrong with them. 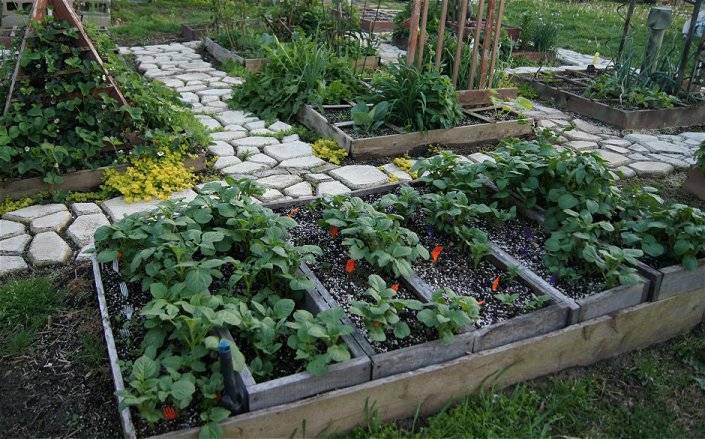 Here is the potato garden now. It looks like they are growing good! 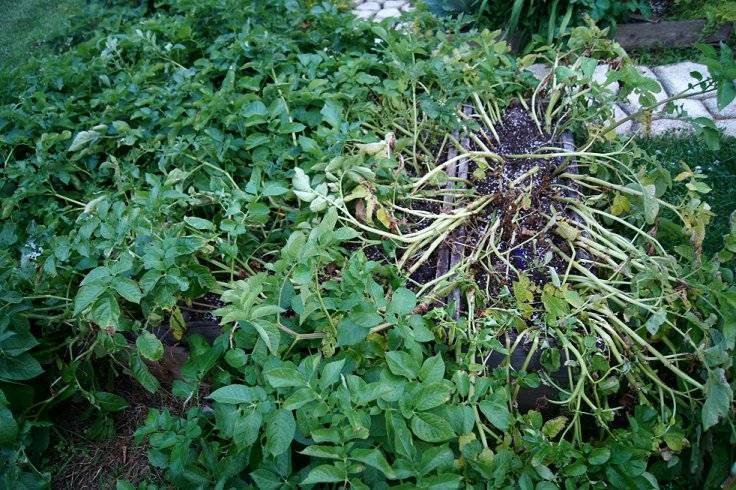 The one end of the potato plants on the one end of the garden is starting to die now. 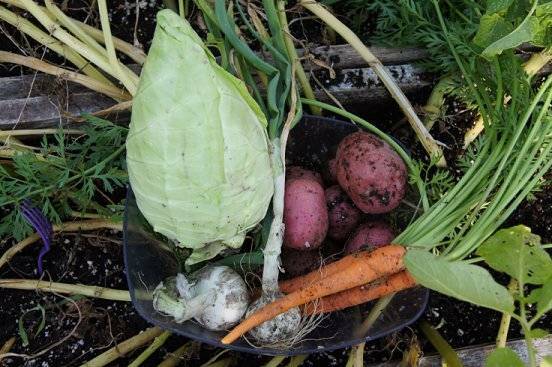 Today my mom needed some potatoes for some homemade vegetable soup, so I reached in and pulled out 11 pretty good size potatoes, I was careful not to pull up any plants, the red potatoes were just below the soil, I didn't want to disturb the white ones that's growing on the bottom layer. I think it's going to be a good year for the potatoes, I think there is a LOT more in there, I only picked from a square foot area of the garden. Today I picked all the potatoes both red and white from the 3 squares on one end of the potato garden. 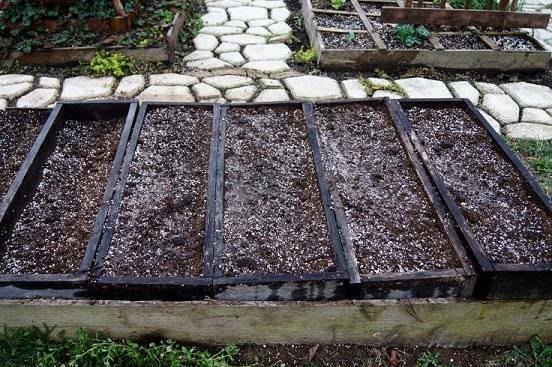 I had planted 12 white in the bottom 6 inches and 12 red pieces on top of the white potatoes in a 4 inch rise with soil mix in it also. The plants on that end were looking pretty much done, so I wanted to see what was in there! I had already took out 11 of the red on the top layer, and I got 45 more, making a total of 56 red potatoes, some of them are smaller, but still big enough to cook and eat. I got 40 white ones. 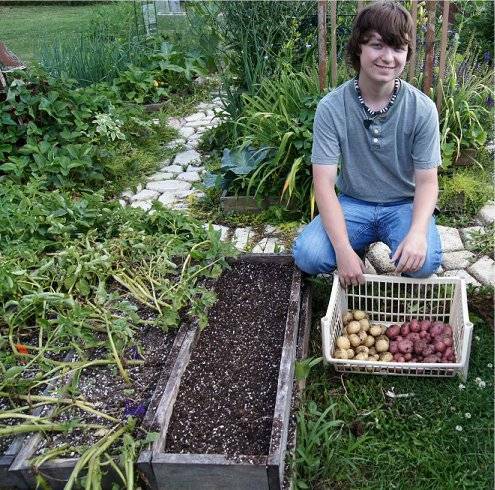 That's a total of 96 potatoes from a 1 x 3 garden, starting with a 1 x 6 inch deep garden with a 1 x 4 inch rise, using the soil mix. 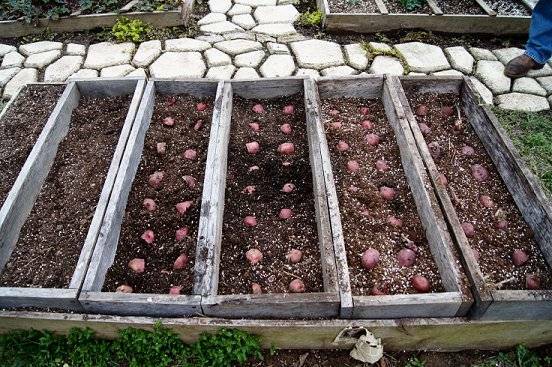 That's pretty good results from just 3 squares, the layering method works, planting both red and white potatoes from the same squares. There was 3 lb. 7 oz of white ones. 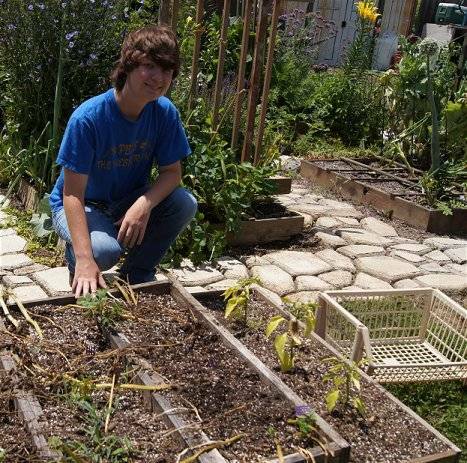 I plan on replanting the 3 squares I just harvested, last year I did that and got a second crop. Today I picked another 3 squares of potatoes, and here is what I got. There was 52 white ones, and they weighed 5lbs 3 oz. 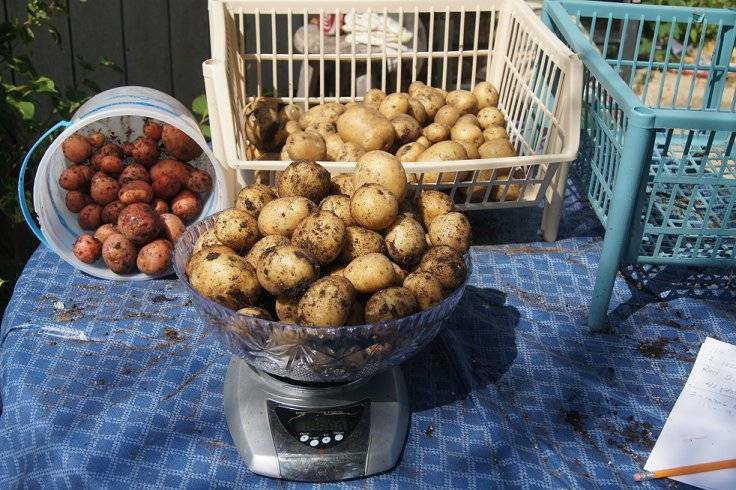 for a total of 6lbs 13 oz of potatoes from 3 squares. I planted 3 banana pepper plants in the empty 3 squares that I picked the other day. I have some extra plants that I'm going to plant as I empty out the potatoes. Yesterday I finished picking all the potatoes in my 3 x 6 SFG. 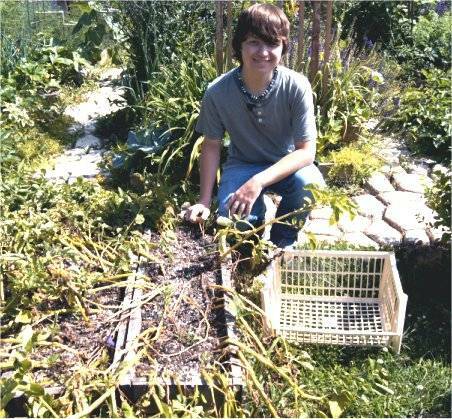 I had four 1 x 3 six inch deep garden of white potatoes left and I picked 225 white potatoes weighing 19lbs 1 oz. 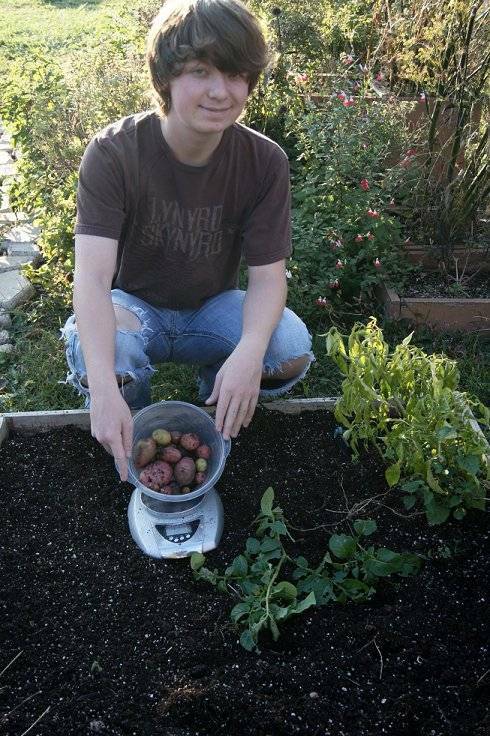 I had two 1 x 3 four inch deep high rise growing red potatoes on top of the white, and I got 41 potatoes, weighting 2lbs 10 oz. Altogether, in the 3 x 6 x six inch deep, with four 1 x 3 four inch deep rises, I got a total of 36 lbs 13 oz of red and white potatoes. I laid them out in the yard and sprayed them with the garden hose to clean them off. I thought I was done with getting potatoes, but I seen there was a couple potato plants growing in the potato garden so I pulled them up to see if there were any potatoes and I got a pound of mixed red and white and even a couple of purple ones. So my total for the year from my layered 3 x 6 SFG was 37 lbs 13 oz.